Launched last month in Naples by Sophia Loren, the MSC Fantasia is billed as “the most beautiful ship in the world.” Indeed, the 133,500-ton, 3,900-passenger vessel is a stunner, full of Italian ambiance. 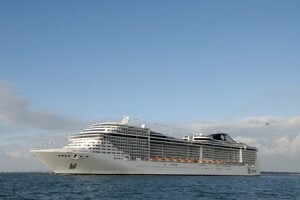 MSC Cruises is little-known in the U.S, but it’s the fastest growing cruise line in the world. The family-run line started in 1987 and is a division of Mediterranean Shipping Company (MSC), the world’s second-largest cargo ship operator encompassing some 400 vessels. The company has built up a 10-strong fleet of new cruise ships since 2003, and hopes to make a huge splash with Fantasia. On the outside, MSC Fantasia looks much like any other mega ship that’s built as a destination unto itself. However, the real beauty lies within. The most important factor onboard the Fantasia is its advanced design and ultra modern technology to minimize its carbon footprint. It has already won accolades from European environmental groups. The ship boasts many unique features in a refined decor of golden tones, colored marbles, mosaics, glass works and sculptures. But perhaps the biggest achievement was making this vast vessel feel amazingly intimate. As you journey around the ship, you pass from one distinct area into another, each a stylish triumph of good taste. Among the many public spaces are standouts such as the charming, shop-lined Piazza San Giorgio, an Italian-style square in Ligurian tradition paved in stone with terracotta border and a frescoed ceiling simulating night and day. Also worth mentioning are the avant-garde Manhattan Jazz Bar, the Sports Bar with memorabilia including world champion Giacomo Agostini’s motorbike and the romantic L’Etoile restaurant, inspired by the Parisian Belle Epoque, with à la carte French cuisine. A hot spot is the Liquid Disco, in bright pink resin, which rises on stilts over the fountains of the Aquapark with ‘pools’ of glass on the walls and the dance floor, and specially shaped sofas and seats. Like all new cruise ships, Fantasia has abundant entertainment options. The spectacular three-story, 1,603-seat, high-tech Avanguardia theatre hosts various entertainment acts. Innovative features include a Formula 1 simulator and a 4D cinema. There’s a casino and bars everywhere you look – 20 to be exact. Because Fantasia is designed to operate year-round in the Mediterranean, it’s the first ship in the MSC fleet to offer a pool area under a magrodome (sliding-glass roof). As well, its outdoor pool, called Aquapark, is not only the largest onboard but also features an outdoor movie screen and 150 illuminated water fountains. Another key sun deck feature is the adults-only Zen area with really ultramodern sun loungers. For children, the North Pole mini-club features polar bears and igloos along with counselor organized activities, while the teens get their own vibrant disco, Graffiti. One of Fantasia’s main attractions is the 17,384 square feet Aurea Spa with feng shui layout, stone-accented walls and light green soothing tones. There’s a vast gym with panoramic wave-watching views and each treatment room overlooks the sea. The spa employs Balinese therapists and for the first time is managed by the line itself. Richard Sasso, president and CEO of MSC Cruises USA, says it was important that the line manage its own spa. “Wellness is a very important and other concessionaires are too pushy, trying to sell products. We don’t believe in that, we want our guests to have a relaxing experience.” Bravo! I wish more cruise lines would do this. Of Fantasia’s 1,637 staterooms 80 percent are outside staterooms most have balconies and there are 109 suites between 193-699 square feet in size. The standard cabins are nicely appointed in dark wood and dark color schemes. The bathrooms are, unfortunately, a disappointment just basic white that doesn’t fit in with the overall opulence of the ship. If you want real accommodation elegance the Fantasia offers the Yacht Club. This VIP area located in the front of the ship on Deck 15 and 16 features 99 suites, a bar, solarium, pool with a sky dome, lounge with a transparent ceiling, and round-the-clock concierge and butler service. Stairs and some floors are made of Swarovski crystal, and passengers have use of private elevators. Of course, this luxury doesn’t come cheap; each Yacht Club guest will shell out approximately $4,000 a week for the privilege. Fantasia has two main dining rooms– the two-story Red Velvet and Il Cerchio d’Oro and two buffet venues – Zanzibar and L’Africana. The ship also features three specialty pay-as-you-go restaurants — El Sombrero is a casual Tex-Mex-themed restaurant, L’Etoile, on Deck 15, serves fine French cuisine, and Italian La Cantina Toscana restaurant in the Top Sail observation lounge serves pizza and antipasti. There is of course room service, but be forewarned – you are charged for items ordered. I have to say I was so disappointed with the food during my two-day preview of Fantasia. Oh, how I wished the cuisine had lived up to the wonderful scents of garlic, onions and Parmesan that permeated from the galleys. I experienced three very good pasta dishes during my two days onboard, but that was it. The breakfast and lunch buffet was the worst I’ve experienced on any ship – selections were sparse and the entrees uninspired. Additionally, dining in the ship’s main restaurants was frustrating. Service was a bit rough around the edges as servers seemed overwhelmed and most did not have a good command of the English language. To be fair, I did not experience the ala carte dining areas, which I was told by those sailing longer voyages, was quite good. I’ve cruised in Europe many times and knew that my shipmates would be a cosmopolitan mix with a number of smokers, but I’ve never been inundated by cigarette smoke like I was on Fantasia. It appeared that every European decked out in Gucci and Armani always had a cigarette in hand. Upon entering the coffee bar Il Cappuccino, I was assaulted with clouds of cigarette smoke. This smoke ended up trickling down to other parts of the atrium area where you couldn’t escape it. One area I should have been able to escape the smoke was my stateroom. That was not to be. I was awakened both nights at 3:30 a.m. sharp because a passenger or passengers around me chain smoked and the smoke seeped into my stateroom. It was hell — so much so that I had trouble breathing and had no recourse but to spend a lot of time on my balcony in chilly 40 degree weather. I called down to the reception desk to see if they could do anything. Again, I encountered someone who did not speak English well. I brought up my issue with Sasso and he seemed genuinely upset. “MSC strongly discourages smoking in the cabins,” he said. Yes, there’s a sign on the balcony door stating “No Smoking On Balconies” but it adds that ashtrays are provided in the cabins and there’s even one attached on the wall in the bathroom. That’s not really discouraging. The MSC Fantasia is a gorgeous ship; however, the beauty was literally clouded by the non-stop smoking onboard. Sadly, I just couldn’t wait to get off – in fact I ran off the ship as soon as I could. MSC Fantasia sails 7-day Mediterranean cruises from Genoa, Italy calling at Naples, Palermo, Tunis, Palma, Barcelona and Marseilles. MSC caters to families and has a generous “Kids Sail Free” offer is that is available on all its ships when kids ages 17 and younger share a stateroom with two full-fare-paying adults. Fares start at $750 per person. Visit MSC Cruises Web site for more details. Too bad about the food on the ship. Southern Italy incorporates the most amazing seafood into its dishes. I’ll never forget the lemon anchovies with bruschetta that I had in Positano. Absolutely amazing! What a shame about the food and the smoking with so many other promising features. The fares sound reasonable and the discounts for children / teens make it a nice family option. The eco-friendly approach is appealing as well. i made a cruise like this a few years ago with aida. these are the ships with that smiling lips painted on the outside. i really can recommend this type of travel if you want to relax, sleep, read books and eat eat and eat. Europeans on holiday = smoking! In France, it almost seems like everyone smokes, and if you don’t you’re social outcast!